There are awesome projects, and then there are things that make us drool on the keyboard. We just got done wiping up our mess after seeing this go-kart which uses four hub-motors as direct drive wheels. We’ll admit, this is more artwork than a hack as these guys are mechanical engineers and know what they’re doing. But how could we pass up sharing something like this? The design is smaller than any of the other go-karts we remember seeing. The low-backed pilot seat is the biggest part, with a cubby-hole beneath it for the batteries and control hardware. Each of the hub-motors was hand wound and reading through the related blog posts it seems this was a huge and painful part of the build. 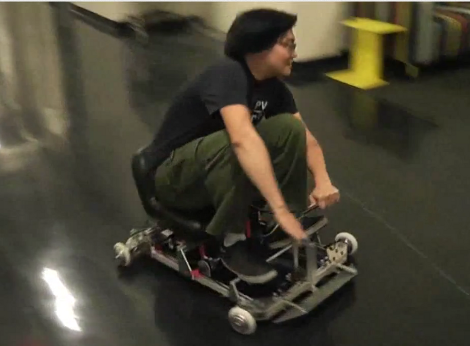 So it’s pretty fun to watch these guys tear up the hallways of one of the engineering buildings at MIT. But the footage of a two-kart race up a spiraling parking garage in the middle of the night is absolutely delightful. You’ll find both videos embedded after the break. [Brad Graham] wrote in to let us know about his electric bike data dump over at atomiczombie.com, written just for us! Last we heard from [Brad] he was building some serious robots and freakishly tall tallbikes but since the weather has turned for the chilly its time to focus on indoor projects. Using a combination of robot parts, electrical conduit, and OEM bikes for the frames [Brad] takes us through several of his builds and all the various complications trying to drive the (often very powerful) electric motors. The builds range from scrapping motors and controllers to full blown drop in hub motor systems that can combine human and electric power. There is even an electric pusher cargo cart designed for a cooler, because beers are not going to haul themselves around. Don’t forget to check out the AtomicZombie website for a ton of useful tips to chopping up bikes for your own mutant transpiration projects, we know we will. Thanks [Brad]! Someone let [Tane] play around with welding equipment and bicycle parts and look what happened! He built a diminutive velocipede. Now that’s just a term for a human-powered land vehicle, but the term fits a bit better as this is missing most of the stuff you’d expect to see on a bicycle. He started with a mountain bike and a kick scooter, then went to work on both with a hack saw. A bit of welding and angle grinding left him with what you see above. 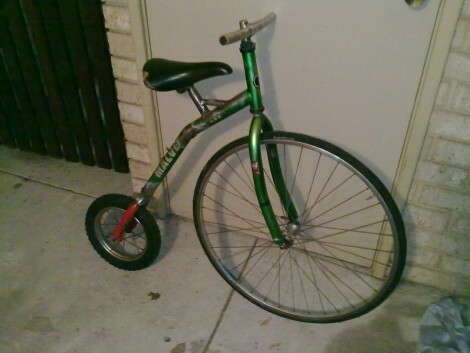 It’s still steerable, but missing are the cranks, chain, and brakes. That’s okay though, the bike is low enough for your legs to reach the ground – you start it up and come to a stop Fred-Flintstone-Style. [Tane] originally meant to add electric propulsion but didn’t quite get around to it. There’s always the option to add a hub motor to the rear wheel if he has the time and motivation.